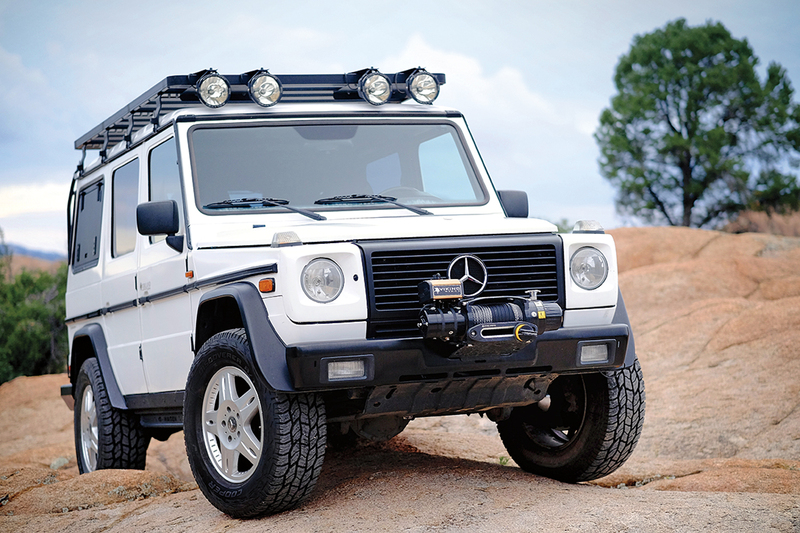 The venerable Mercedes-Benz Geländewagen is the elder statesman of overland vehicles, having been in production for nearly 40 years. 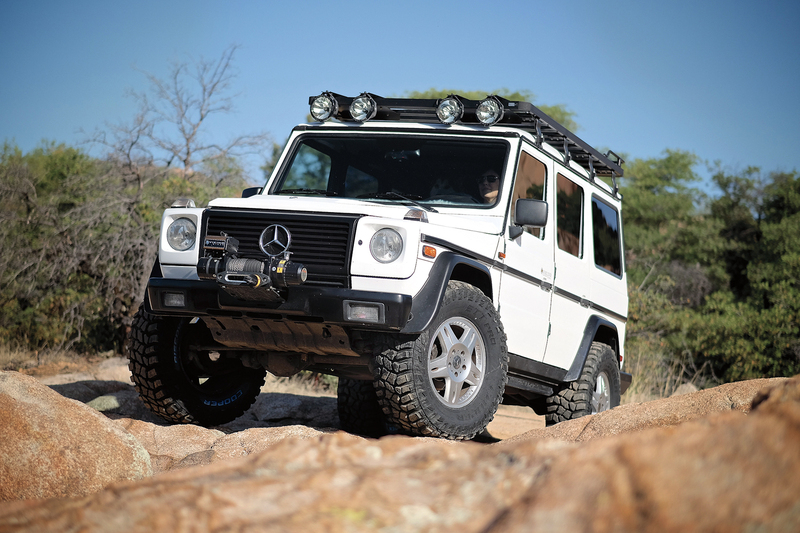 While most G-Class vehicles are relegated to a sentence of domestic carriage for urbanite families, some have been rescued to live the life of a Teutonic adventurer. This is certainly the case for my 1996 W463 G320 wagon, a vehicle purchased new by one of Overland Journal’s charter subscribers and used for travel throughout North America, even venturing as far east as Cape Spear in Newfoundland. In 2009, I purchased the vehicle (thank you again, Mr. Gulden) and it immediately began life as an overland vehicle and training tool for our work with MARSOC. A few years later, longtime friend Thor Jonsson from Thor Motorworks and Viking Offroad contacted me about using the vehicle for a product development platform. Off it went to California where Thor worked with Karl Volger from G-Wagen Accessories (GWA) to design and install many of the modifications featured here. After two years in Thor’s capable hands, it was time for the G-Class to return to Overland Journal and become my daily driver and primary adventure vehicle. With all of the new modifications I could not have been more excited, but the new toy was shortlived—literally. While driving on Interstate 40 to the Sierras, the AMG motor had a rod cap bolt failure and totaled the engine. Leaking oil onto the asphalt, the Merc would need to wait until Expeditions 7 ended to receive a new heart. Luckily, one of the best independent Mercedes shops in the country is located in Prescott, Arizona, so we loaded the injured beast onto a trailer and handed the keys to Darren from DeYoung European Motors. The decision was made to entirely rebuild and renew the drivetrain, using as many new or OEM remanufactured parts as possible. Many of the AMG performance components (like the head) could be salvaged, and a factory specification long block was sourced through Metric Motors. One of the more painful purchases was a new old stock oil pan, which was the last available globally and cost as much as a slightly used kidney. 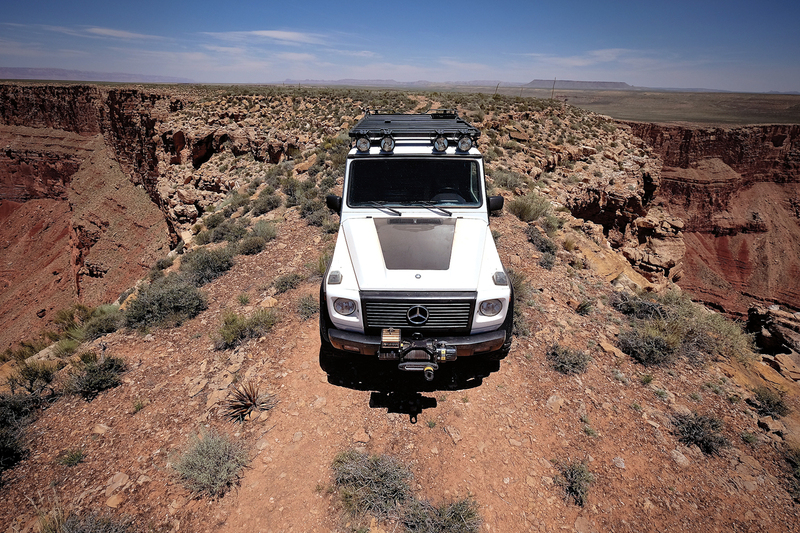 Months later the Geländewagen roared to life, ready for its new chapter of exploration. In this first installment of the publisher’s project, we will focus on trail performance and exterior modifications. 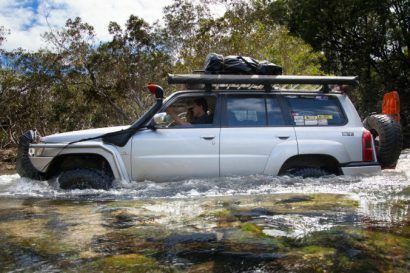 Fortunately, the G-Class requires minimal changes for remote travel and many of the accessories can be sourced as factory parts. The platform is available in so many configurations and for military applications that different bumpers, springs, shocks, and even portal axles can be found from the parts inventory. This approach works well with my philosophy of vehicle builds, which is to perform the minimum required changes to achieve the desired performance and durability standards. I am happy to sacrifice shiny objects and luxuries for reliability and simplicity. The G-Wagen comes from Graz, Austria, with impressive technical terrain hardware, including three locking differentials and generous approach and departure angles. However, I did want to improve body clearance and also provide for additional load capacity. A change in springs can vary payload ratings up to 2,000 pounds, so we installed factory Eibach purple springs, which are longer and have a firmer spring rate. This swap was complemented with new Bilstein shocks and suspension bushings all around. The 1.5-inch lift provided additional clearance, so we experimented with everything from 32.5-inch all-terrains to over-the-top aggressive 35.1-inch mud-terrains. While the big STT Pros looked great and performed well in mud and rock, they were too big for mixed use, so I selected a 275/65R18 Cooper AT3 on factory 18-inch alloy wheels. I do intend to source another set of wheels in a 16-inch size and install taller, narrower tires for more severe conditions, but for now this solution has not disappointed. 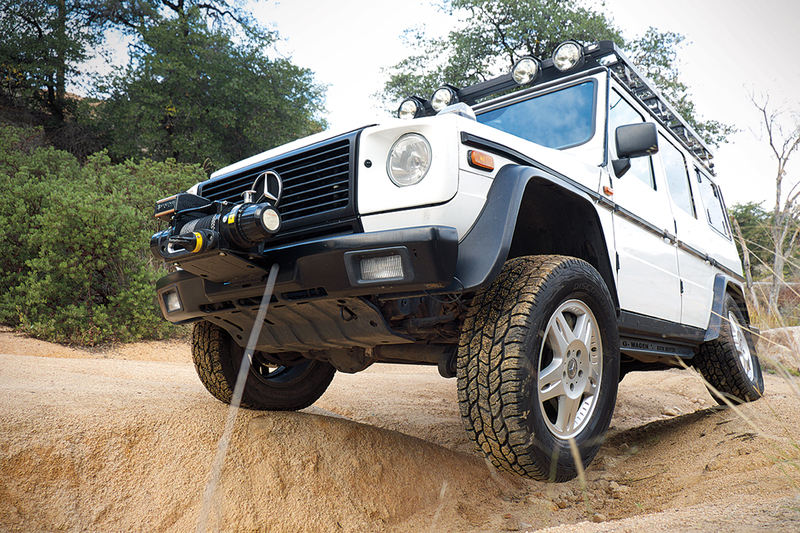 All G-Class are factory fitted with metal front bumpers, but it is possible to source a factory HD unit with an integrated tow pin. 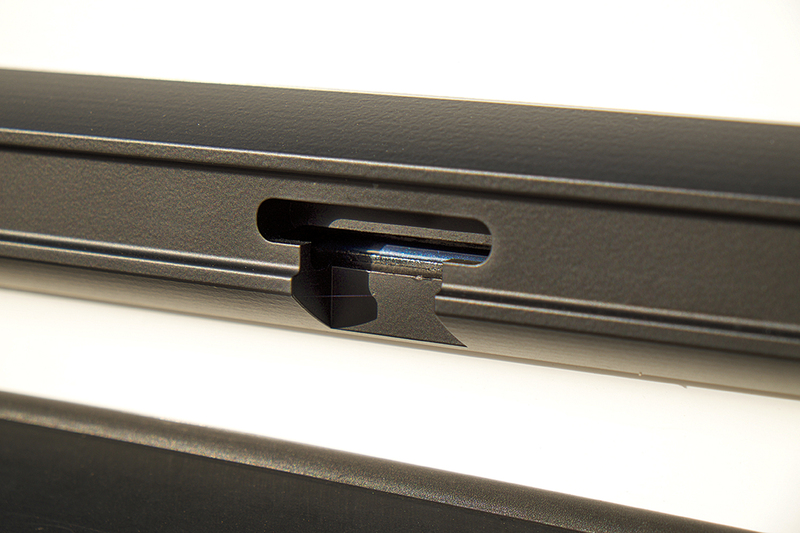 These bumpers are designed for the military 461 models, but easily install on the 463 variants as well. 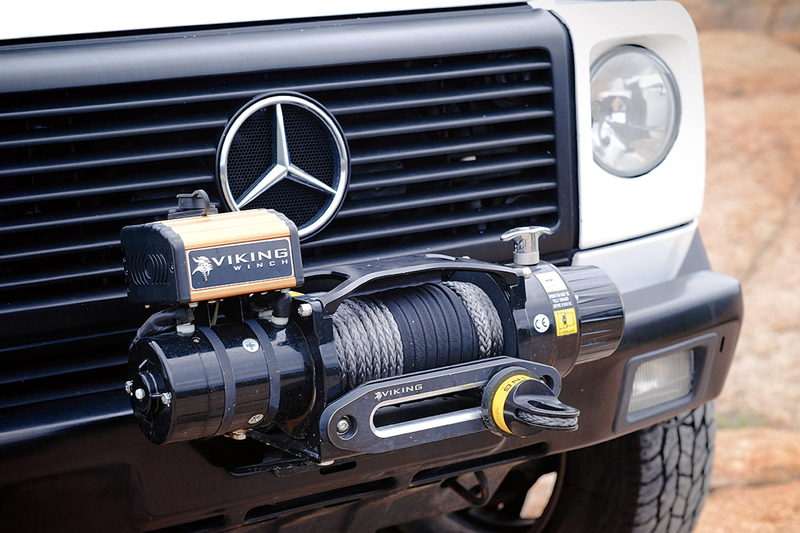 Bucking the trend, I did not fit a bull bar, but did purchase a removable winch tray from GWA that uses the reinforced pin and recess to secure the Viking 9,000-pound winch (manufactured by COMEUP) with Viking synthetic rope. Further back on the chassis, we mounted discrete rock rails (also from GWA) that protect the lower sill and exhaust. It does not protect from a horizontal impact, so I may fabricate round tube sliders to also function as a step and attach to the lower GWA units. Rear bumpers on the W463 are a weak link, the main structure being fiberglass and the end caps made of rubber. 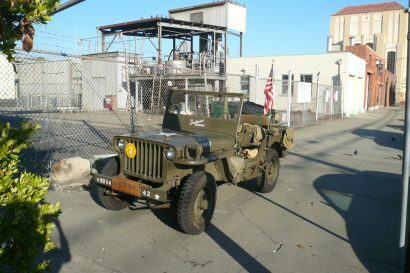 To resolve this, a GWA unit was selected, a product constructed from welded steel and designed to look relatively stock, even integrating factory lights and a receiver hitch. Beyond the excellent rock protection, the solution provides two 30-mm-thick recovery points welded to the face. So far, the trail modifications have enhanced the already competent stock performance; the rock protection provides additional confidence to push the platform a little further. With the technical terrain requirements addressed, it was time to consider other modest modifications to improve comfort and convenience. 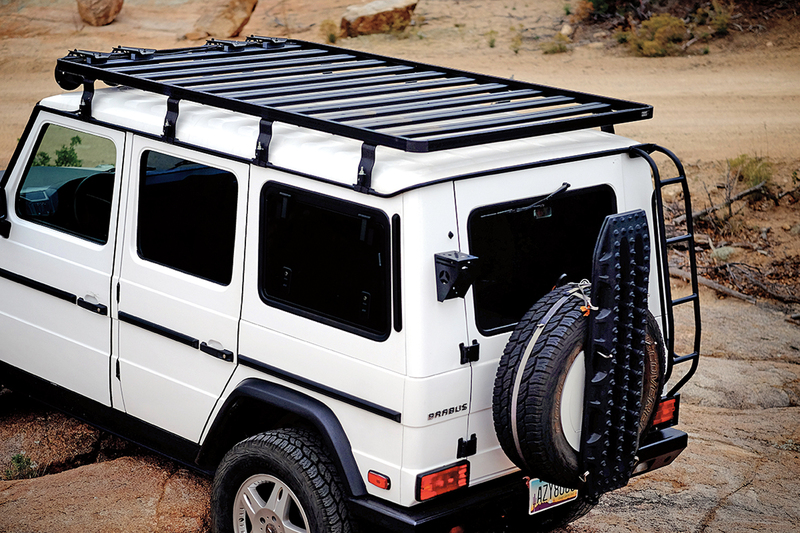 One of the best ways to substantially increase reserve capacity is by installing a low-profile, lightweight roof rack. The goal is to have a means of carrying temporary loads and extremely light accessories. (For vehicles like this, I recommend roof loads of less than 150 pounds.) The roof rack also provides a flat surface for sleeping off the ground (yet under the stars) or as a photography platform. We selected a modular Front Runner aluminum rack which allows for a nearly unlimited combination of cross slat spacing. 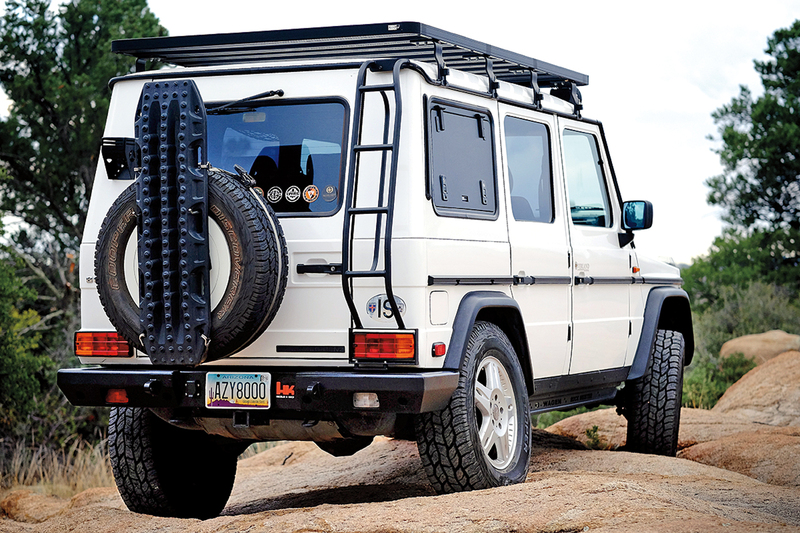 To access the rack, a GWA steel ladder was chosen and mounted securely to the rear body mount and drip rail. 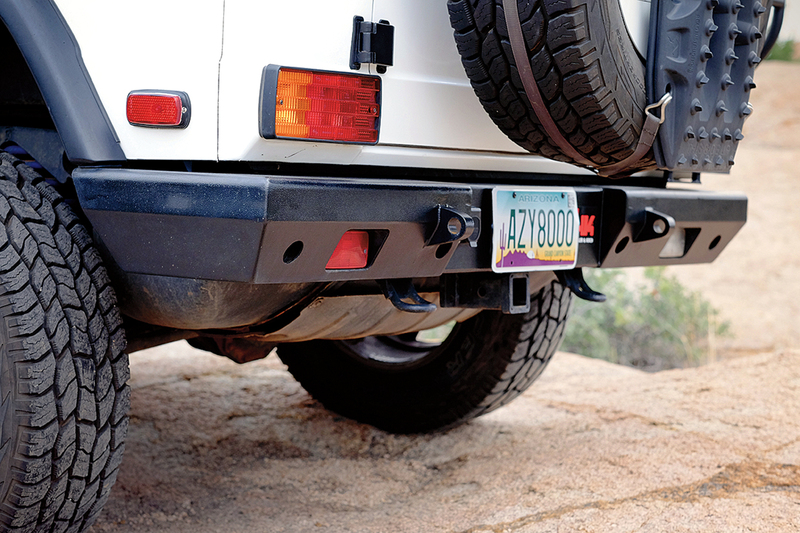 To the front of the rack are four Baja Designs HID lights, the outermost units serving a driving pattern and the innermost projecting a spot beam. 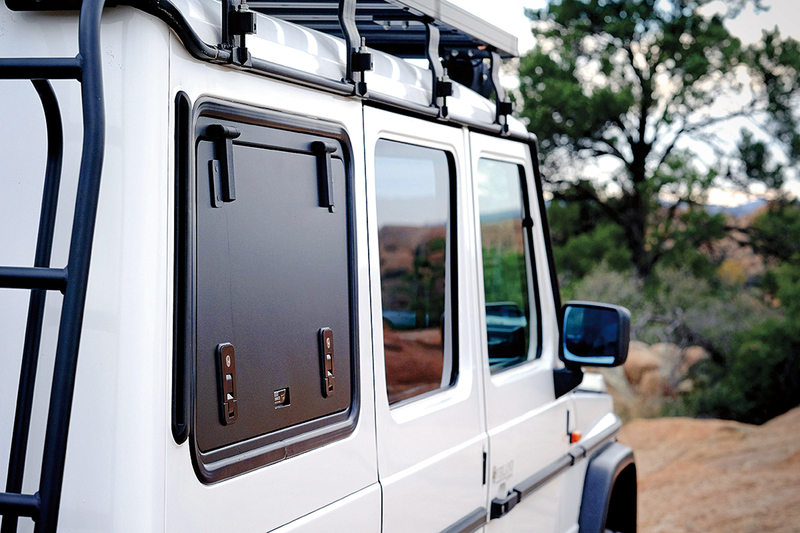 A matte-black hood decal minimizes reflected light, and we wired the units to activate from factory switches. Even after years of use this rack is completely rattle free. The final exterior modifications implement three innovative products. The first is a GWA storage panel that takes advantage of the void in the spare tire. This door finishes off the unsightly reversed wheel and allows me to store a recovery strap, several screw pin bow shackles, and a pair of gloves. The second, and one of the more interesting changes, was the fitment of the Front Runner gullwing windows, which are available with either solid aluminum panels (black powder-coated) or tinted glass. On the G-Class, these units are quite useful, easing access into the large storage area aft of the seats. 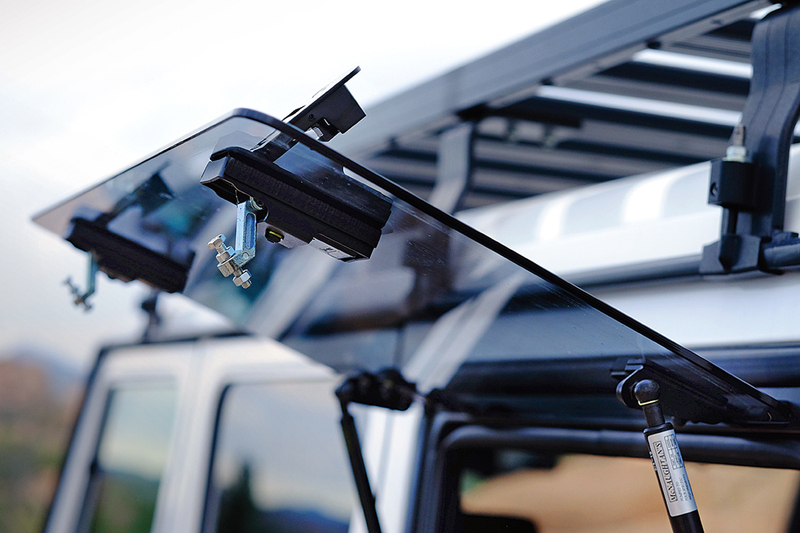 With the aluminum plates installed, security is significantly improved, but at the cost of rearward visibility. Even so, I like the aesthetics of the product and after trying both options ultimately selected the solid metal solution. Each side has two locks and came key matched. 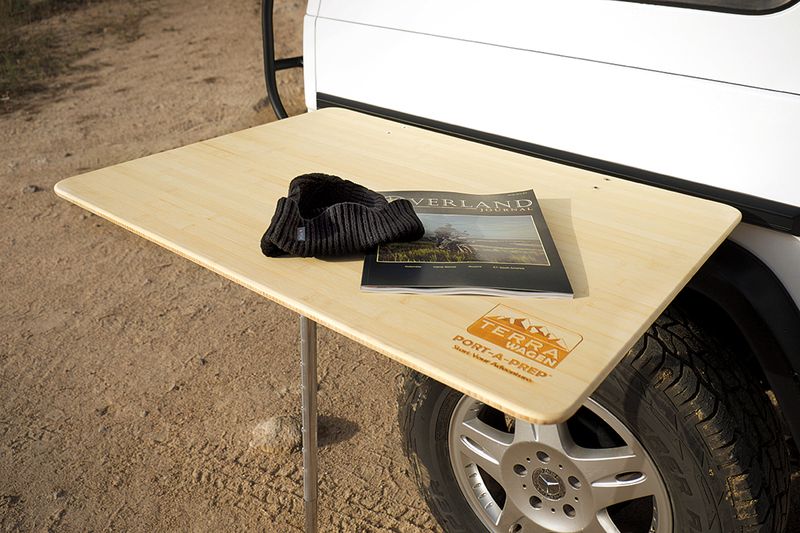 The last accessory is a G-Wagen-specific table by Terra Wagen that is pure engineering art. It is rare to find a product that is so innovative and built to such quality and precision. Installation starts with a solid piece of machined aluminum that perfectly matches the profile of the factory body trim rails. In a few minutes, we had removed the OEM rail and installed the unit with the supplied high-strength, double-sided adhesive tape. This new structure provides the mounting for the back edge of the exquisite bamboo table. Two T-bars slip into the machined slots and then the front surface is supported by a single telescoping pole—absolutely brilliant. 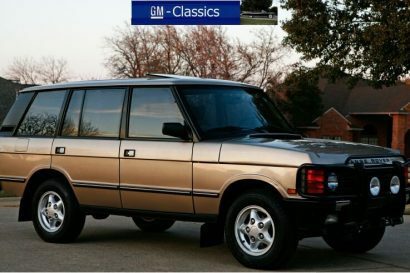 While the trail and exterior modifications are certainly minimalist by most magazine project standards, I am pleased with the result in the field and appreciate the limited negative impact to GVWR, high-speed road handling, and overall driveability. 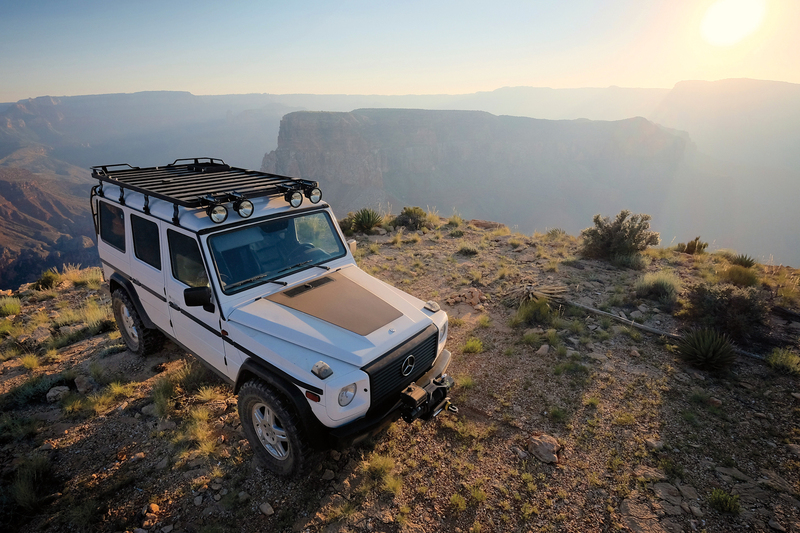 As G-Wagens become increasingly affordable (used), we are seeing more rescued from valet life and repurposed for true adventure. 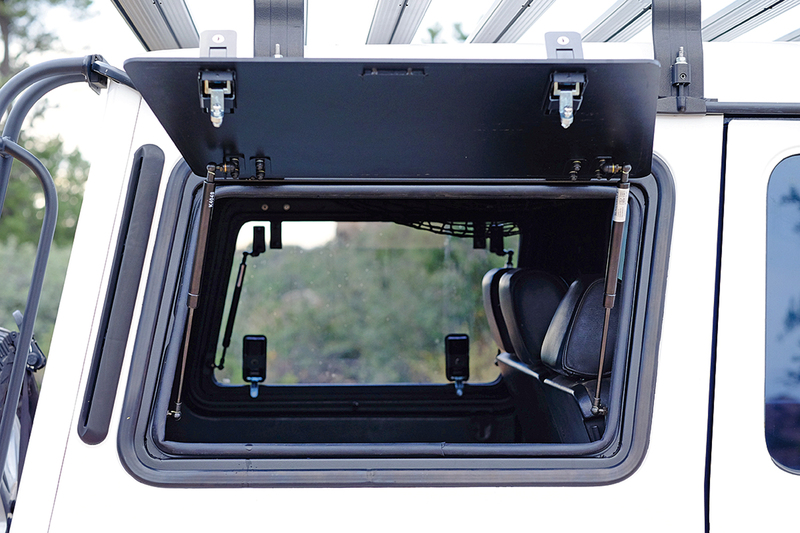 The market is also responding, being led by innovative companies intent on producing high-quality solutions for “the pointed three.” In the next installment, I will review interior modifications, electronics, and storage systems, along with a few surprises that refine our take on this classic overlander.